Sarees are becoming more popular as the years pass by, from the traditional weaves which are back in trend to the stylish modern ways and different ways to style a saree. New saree drapes and indo western saree trends have actually made saree a very versatile piece and appropriate for all occasions in India. Modern saree styles today are more on mix and match to indo fusion looks to adding statements to a simple saree and turning it to a western saree outfit. Some of the styling tricks involve different option to the saree blouse and different drape styles. Yet, there are some more modern saree trends you need to follow for this season. The trend of pompom was very high last year and tassels are hitting high this season. Mixture of these with a classic outfit like cotton or linen sarees is a statement modern saree. We have seen celebrities shift to cotton and linen saree looks to events and outings these days. These are very trending sarees with fringe and ruffled sarees have been opted by many television stars too. We have seen the trend in plain sarees to double colour. Sonam Kapoor fringe saree look is styled in a simple classic avatar. 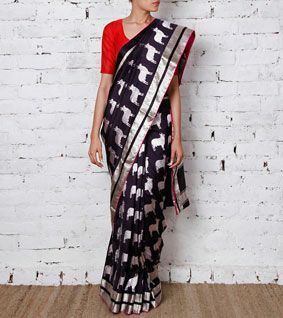 These days the trending styles for a saree would be with a modern looking blouse or say a top instead of a saree blouse. The look is office friendly, party rocking and also chic for a wedding too. Style saree with crop top, saree with white shirt, saree with off shoulder top, saree with bodysuit and much more. This was a huge trend and is still on this season too. Style a party saree with a cape over whether you want a waist length cape or a low back shrug cape. The choice is yours and this adds the edgy look to your saree style. Figure sarees in silk a new look and these make the wearer feel classy and quirk styled. The look is already stylish and one of the most trending modern saree types. There are many kinds of figure sarees at G3fashion which you can always pick for festivals to parties. Wearing a Modern saree is easy with these few tips of the saree trends, now you can also look stylish in a modern saree. The best look of a Modern Saree is a Plain Silk Saree, which is the hype so far in silk sarees.